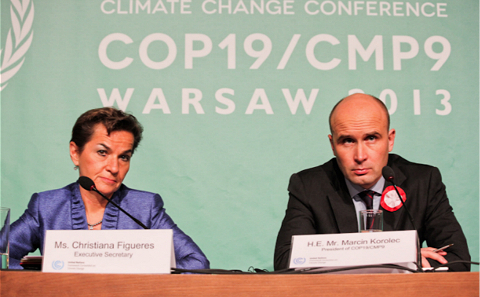 Last week, it was Warsaw’s turn to host a disappointing meeting on climate change. Over the past two decades, many other cities have had this pleasure. This time, 195 countries painfully agreed to make a “contribution” to combating climate change, in place of a more robust “commitment”. The aim is still to reach a strong agreement in Paris in 2015. The chances of success must be negligible. Experience shows that. What makes this depressing is that the world could probably eliminate the risks of catastrophic outcomes at limited cost, provided it acted quickly, effectively and in concert. In his new book, The Climate Casino, William Nordhaus of Yale, doyen of climate economists, argues that the cost of limiting the increase in global temperature to 2C would be 1.5 per cent of global output, provided the right action were taken. This is only half a year’s global economic growth. But abatement would be far costlier if countries responsible for half the emissions did not participate: keeping temperature increases to 2C would even be infeasible. Professor Nordhaus, a moderate voice in this debate, explains why the world should accept the costs of action. The greenhouse effect is basic science. Emissions have risen rapidly. Atmospheric concentrations of carbon dioxide are now more than 400 parts per million – 50 per cent higher than before the Industrial Revolution and well above levels over the last 1 million years. Global temperatures have risen over the past 150 years. The recent temperature plateau is not exceptional. Climate scientists have been unable to find an explanation other than human activities for the increases in temperature. Climate sceptics argue as if uncertainty means that the right thing to do is nothing. On a foggy road, the number and speed of other cars is particularly uncertain. But this very ignorance makes cautious driving essential. The same applies to climate. Given the uncertainties about the climate system, the wisest course is surely to drive cautiously. A particularly important aspect of that uncertainty is tipping points. We know that the earth’s climate has changed sharply in the past. It is possible – even probable – that some insufficiently understood process could tip the world into another and perhaps irreversible state: the collapse of large ice sheets is such a possibility; another is large changes in ocean circulation; and yet another is positive feedback processes on warming. Moreover, while humanity might hope to manage the economic effects of such events, the same is not true for their impact on the oceans or on mass extinctions. It is irrational to play in the climate casino without seeking to eliminate worst-case outcomes. Some people are excited about thepossibility of geoengineering. But that is to add yet another gamble. It is surely more sensible to limit excessive accumulations of greenhouse gases, provided it can be done at less than crippling costs. Emissions, then, are a negative global spillover of economic activity. We do not know the cost of such externalities. But we can be sure it is greater than zero. Externalities do not fix themselves. In the absence of effective individual property rights they require government action, in this case the action of close to 200 governments. The simplest solution would be for every country to agree on a price. Each country would then levy a tax: Prof Nordhaus suggests this should be US$ 25 per tonne of carbon. The revenue would then stay at home. Negotiations would be only over that price. Meanwhile, high-income countries would focus on investing in research and development of relevant new technologies and in ensuring that the best technologies were available cheaply to emerging and developing countries. Why should they do this? The answer is: because a low-carbon atmosphere is a global public good. It is by now impossible to be optimistic that anything like this will happen. This is partly because the needed agreement must be long-term and global. That, in turn, raises difficult questions of intragenerational and intergenerational equity. But the likelihood of failure is also because of the (successful) efforts of sceptics to muddy the intellectual waters and the understandable resistance of affected interest groups. Some industries – electric utilities and energy-intensive activities – will complain. But such complaints have to be kept in context. The loss of jobs in the politically powerful US coal industry might be 40,000 over a decade. Against what has happened to the US jobs market since 2008, this would be quite a small potato. Beyond that, there are the understandable concerns of ordinary people that they would be far worse off if they could not treat the atmosphere as a free sink. It is also clear that low-carbon sources of energy are still expensive and some technologies are not proved at relevant scales. Moreover, a big effort requires an acceleration in the rate of decarbonisation. That will not happen by itself. It needs a push. The combination of higher prices and support for fundamental research should deliver just such a push. Happily, the evidence suggests that, either because of ignorance or inertia, households and businesses are not currently optimising their energy use. The combination of higher prices for carbon and firm regulation might even deliver some unexpected benefits: lower carbon emissions without any loss in output. Suppose that, despite all the logic, it proves impossible to achieve a relevant global agreement. Does it make sense for any country or group of countries to take determined action on their own? If the aim is to deal with climate change, the answer is: absolutely not, unless the countries are China or the US. Indeed, even if the countries were China and the US, it would not be enough, since they account together for only a little over two-fifths of global emissions. But it might be possible for a country to demonstrate proof of concept: that it is indeed possible for economies to grow fast while reducing emissions. In the process, such a country might even, as some argue, gain an important lead in some relevant new industries. In any case, some countries have to try. Otherwise, as everybody hangs back, efforts at effective agreement must fail. We would then end up taking a gamble on the absence of any bad and irreversible outcome.